For the February Hoard, I am probably biting off more than I can chew. So I am starting early. I wanted to do a circus tent, but hadn't decided on a pattern. Still haven't. I then found several circus papercraft. Most of these tents are red. So I most certainly won't be doing all red. It seems like there are stripes appearing on the roofs late 1800's, but almost a given starting in the 1920's. After WWII, many of the circuses went to solid colors or solid colors with decoration. Looking at these papercraft tents, I like the additional tent structure over the entrance. On the one, there is a sort of wall that folks go through to enter the Big Top. I may go with one idea or the other, but I think using both may be overkill. I also want to do two cage wagons and two freight wagons. That will probably be all I have time for, but I would like to do a calliope or band wagon and a ticket/office wagon. I haven't got it all worked out yet, but I plan on doing a white undercarriage that can be modified for each wagon to keep things relatively simple. I have seen a couple old black and white parade photos and photos of wagons loaded on circus trains. Except for the big boys, circuses didn't color coordinate their wagons. Hard to tell what colors the different shades represent, but the wagons definitely did not match. So I am just going to pick out the ones that I think I can do most quickly regardless of color. The first one will go with anything, a white cage wagon with a tiger in it. That's a lovely exploded illustration I like all the construction details visible in the wheels. On the other wagons I've done, you can see through the spokes, so I can extrapolate what is behind them. Circus wagons have 'flower' wheels, so there is more guess work. 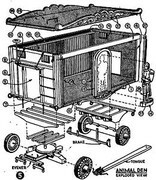 That is an exploded view of a model, not a real wagon, but it would be close to a wagon from the 1920's to 1940's with more iron than wood in the chassis, but still simplified. I'd planned on collating some of the better images tonight, but my knee and back are affecting my focus. I have quite a few wagon images, but not many that explain the mechanics. By having a Chassis folder without all the rest of the wagons, I think I can create boxes that will somewhat keep to the feel. Okay, I want to finish this Cage/Den Wagon though I still haven't found the name of it. Tomorrow's goal is to get the undercarriages worked out, and finish the 'cage' on the white one. Once I figure out the undercarriage, it can be carried over to any of the other wagons. Part of me says I should do a pop-up elephant for this hoard. Part of me says that is a distraction from projects I should be working on. Can I fight off distraction for a whole month? We will find out together. I had thought of that myself, but I want to keep on with wagons. Although I am tempted to go EZ-bild route. Going that way, I could whip out a whole bunch of them, and if someone wanted a circus, they could do a whole parade's worth in an evening. I hope someone will come up with a CWF logo to throw on things. I think the EZ build route is the way to go. Honestly, if I ever have the need to build a circus train, I would only do it this way. I think that is the situation with most folk. Was getting some eye strain working on the cage bars, so did a bit more on the tent. Have to head out for a while, so I thought I'd glue the wheel backs and let them dry while I'm out. These things sit so tall, I think you will want to do this step. You may even want to add a rear axle for added support. I'm glad I looked at this. Your flat suspension here just saved me a few hours of work on the gypsy wagon EZer build. Well, as part of my 'trudging', my washer and dryer died around Thanksgiving, so besides working extra jobs, I have to fit in laundry, which was tonight. Probably could have taken the wagons to the Laundromat, but instead, I finished up some lettering for the tent. Still don't have a logo worked out, but want to do something with the CWF. They don't look narrow to me. Maybe there could be a texture on the top and on the back of the ... sticky-upy (?) bits. They look really good, and there is a whole (short) month to go. 2. Hit it with a sledgehammer for a week until you are satisfied. Where do you look for fonts? I tried before but my google-fu was not strong. I need to do some pennants and posters and adjust textures on the two wagons I have done. I also had an idea to turn this into a circus themed party set. Tent would be a good centerpiece, and the wagons can be gift boxes. Ah, still need to add the circus logo. Glad I looked at this. BTW -- I had mentioned turning the wagons into gift boxes. By having the bottom piece glued in, if you just insert one of the ends instead of gluing, you can put candy or whatever in the wagons. Options -- Do I build the WIP tent tonight after work, or do I build the revised wagons, or do I move on to the freight wagon design, or do I work on horses, etc. ?